A former Ford plant in a New Orleans, Louisiana, suburb was placed on the National Register of Historic Places this week, the National Park Service said. “The Ford Assembly plant in Arabi was nominated to the National Register of Historic Places to recognize the building’s significant role in the industrial heritage of the area and as an excellent example of early 20th Century industrial architecture,” National Park Service historian James Gabbert wrote in an email. The plant was opened in 1923 to build the Model T. At the time, Ford had decided it was more affordable to ship parts to regional factories where the cars could be built and tested rather than doing all of the work in Detroit. “Ford had these plants constructed across the country, which allowed for increased production of finished vehicles,” Gabbert wrote. The New Orleans Times-Picayune reported that within two years of the plant opening, 400 skilled workers were building 150 cars per day. When the plant was shifted to the Model A in 1928, it produced 300 cars per day and was a big contributor to Arabi’s bottom line, until the stock market crash of 1929. The factory was closed in 1930 and reopened in 1931 to meet car demand in Central America and Cuba. In 1933, it became a sales branch and, in ’34, was turned into a parts and distribution facility. The Times-Pacayune reported Arabi — located in St. Bernard Parish — made sense for Ford. The city had access to both new railroads and a deep-draft harbor on the Mississippi River. The plant would help serve both the Southeast and parts of Latin America. The two-story facility, believed to be the last of its kind, was designed by architect Albert Kahn, one of the nation’s foremost industrial engineers at the time and a personal favorite of Ford. “Ford also utilized the services of Kahn to design his headquarters and plants (and home) in Detroit,” Gabbert wrote, adding that the Arabi plant was a quintessential Kahn example. The plant was seized for use as a warehouse during World War II, but it was converted back to a sales and distribution center after hostilities ended. A shed on the property was rented and used as a temporary space for the segregated Arabi Elementary School Annex in 1960, a sign of the changing times. A large influx of primarily white families looking for blue-collar work brought a renewed use for the plant. It was purchased by Southern Service Co., an automotive distributor, in 1971. Four years later, that company’s parent was bought by a rising titan – Toyota. As the Japanese automaker enjoyed a sales boom, the Arabi plant saw thousands of Celicas and Corollas roll through for cleaning, repair and testing. After a cheaper, train-based shipping method was put into practice by Toyota, the plant was sold to Hayes Dockside and used to store coffee, rubber, hardwood and a slew of other goods before they were shipped. That lasted until 2005, when Hurricane Katrina hit. The massive storm drove about two feet of salt water into the building, ruining stocks of boric acid and wax. Since the hurricane, the former plant has been leased to trucking companies for parking but city officials have been eyeing a resurgence of the area. 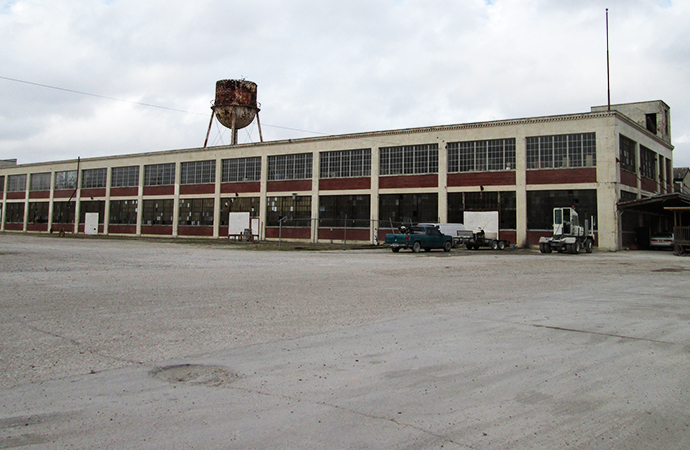 Gabbert wrote that an application for the historic preservation tax credit has already been placed on the building, indicating another as-of-yet unknown use could soon be found for the old Ford plant.